Print out the returns form and fill it in! Remember to include your full order details; address, order number, telephone number and any other info we may need! Please fill out the online form below so we can anticipate your return and prepare in advance, this is especially helpful when you would like an exchange so we can reserve your products in advance. If your item is faulty, you may qualify for a pre-paid label, please contact our customer service team before you return your item for the best way to proceed. 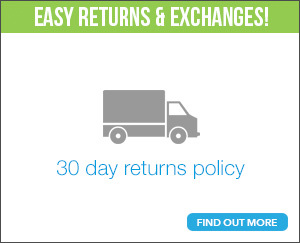 If you do not qualify for a free return you can simply send the item back to us via your preferred method, however we do recommend you use a traceable service so that you can track your items. Some parcels qualify for a free returns service - if your order value was above £25, was originally sent via a courier and you are based in an area that CollectPlus cover, we can cover the cost of your return to us. (Only 1 free return per order). 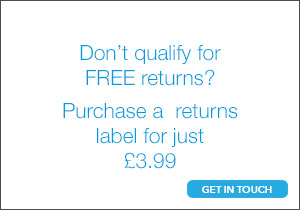 In most cases if you qualify for a Free Return a return label will be sent with your order for you to use. If a label is not provided, don't worry you can print the label of here. You will need your order ID and Email you provided when purchasing. Before using the CollectPlus service please ensure you read the CollectPlus FAQ's below to ensure your return is covered within their service. The most important thing to bear in mind is the dimension must not exceed 60x50x50 cm and should not weigh more than 10kg. If you have not qualified, for just £3.99 you can purchase a prepaid collect plus label. The CollectPlus Service is a quick and easy way to return your item. If you want to use this service please contact our customer service team who can provide you with a pre-paid label which can be paid for over the phone, or you can choose to have the amount deducted from your final refund amount. 1. How many CollectPlus parcel drop points are there? 2. Where is my nearest CollectPlus parcel drop point? To find your nearest store you can visit www.collectplus.co.uk/orders/new and enter either a postcode, town or city. The nearest stores will be displayed on either a map view (20 stores), or a list view (3 stores). In the map view clicking on a location will show the full address and opening hours; these details are automatically displayed in the "list view". 3. When are CollectPlus parcel drop points open? Nearly all CollectPlus stores are open early 'til late, 7 days a week. The opening times for your local store will be shown when you click the flag when you have searched for your local collection point on the CollectPlus website. 4. How long will it take for my order to be returned to the retailer? Your parcel will be collected from store the next working day (Monday to Friday) and returned to the retailer within 5 working days. 5. What is the maximum size that I can return? 6. Can I track my parcel? You can access the tracking at any time by going to our tracking page and entering your CollectPlus tracking code. You can use the 7 character code from your receipt or 16 character bar code that was on your label such as ABC1DE2 or 8KH1234567890A030. 7. What items can I NOT send with CollectPlus? We shall not carry gases, pyrotechnics, arms and ammunition or corrosive, toxic, flammable, explosive, oxidising or radioactive materials or any other noxious, dangerous or hazardous goods or goods likely to cause damage. Living in Ireland? 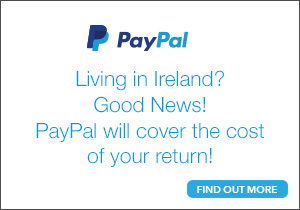 Paypal now offers FREE Returns for Ireland customers! You may have qualified for this when you purchased your item to find out more please visit these links provided. You may have to Log into your account, and please make sure you read all the general conditions! If you are returning an item from outside the UK Mainland, you are responsible for all return costs, we do have subsidised return labels available for German customers and hope to extend this service to other countries in the near future. Our German Returns Service is chargeable at a discounted rate of only ?7.50 which will be deducted from any refund due or can be paid for in advance. In order to request this service please email our award winning customer service team at support@ghostbikes.com. The Customer service team will send you an e-mail, with a returns details form, which you will need to fill out, and a postage label, which you will need to print out and affix to the parcel before sending the item back to us. We recommend that you ask for a proof of postage and use a tracked service when returning your goods, so the parcel can be tracked for any delays or if it goes missing in the mail there is a better chance of recovery. In additional to your statutory rights (please visit our cancellations page), we provide our customers an extended period of 30 Days from the date of purchase to return their item for a full refund or an exchange. During this time you have a duty of care towards the product. We would appreciate if all labels & tags are kept intact and original packaging is returned in an unused condition. If you have a faulty item to return, we recommend you contact our customer service team first and email images of the fault before you send the item back. In our experience we have found we can resolve a lot of issues without the need to have the item back first - this means less less costs to both us and our customer and in most cases a much faster resolution. We aim to turnaround any warranty / guarantee claims very quickly however, In some cases some of our manufacturers like to see the item which may cause some delay. If this is the case we will keep you informed. If your original purchase includes a free gift or gift voucher, you must return the free items back when you are returning the original item. If a free voucher was supplied and already redeemed this will be deducted from your refund. We recommend that you use a tracked for or signed for service when returning your goods back to us, or take advantage of our collect+ service (free if you qualify or just ?3.99) as this provides you with a proof of return. We can not be held accountable for goods that have been lost in transit. Whilst the majority of our customers return their goods back to us in a brand new, unused condition with all tags & original packaging intact, In recent times we have noticed an increase of customers returning used / damaged items back to us within our generous 30 day returns & exchange policy. It is with regret we will now enforce a devalue charge depending on the condition of the item that has been returned back to us. Please remember whilst the item is in your possession you have a duty of care towards it. It is extremely important that if a helmet is purchased that the visor stickers and tags are not removed, if there is any damage to the helmet you will only be part refunded. The devalue price will depend on the helmet or goods purchased and the damage/condition it is returned in.